Arrow and The Flash on The CW have always found ways to incorporate characters from comic lore by adapting them to the present. Now that Legends of Tomorrow has brought time travel into the mix in a big way, some major DC characters can appear in their own eras. The latest DC character will be gunslinger and antihero Jonah Hex, played by Jonathan Schaech of Ray Donovan fame. Shaech recently revealed some details about the gig, and according to the actor, Hex will have an unlikely edge on the Legends. In the story he revealed that he understands time travel. That’s all storyline. [Jonah and Rip] know each other. There’s something that they have to resolve from the past. If Rip was there, he understands time travel a little bit. Jonah Hex does. 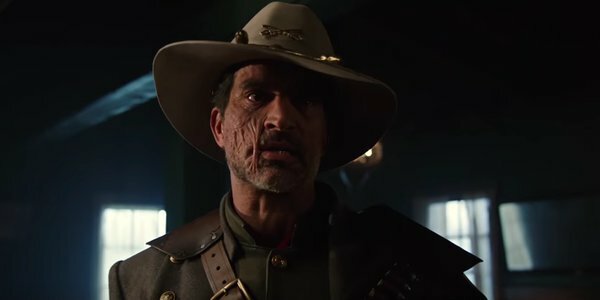 Jonathan Schaech’s reveal to ComicBook.com sets Jonah Hex apart from most of the other characters that the Legends have encountered in their travels so far. Usually, folks in other periods don’t believe that time travel is actually possible, and so the entertainingly bad acting from most of the good guys as they try to blend in isn’t much of a problem. Knowing Rip Hunter and at least somewhat understanding time travel puts Jonah Hex at a distinct advantage. Rip isn’t always the best communicator, so it’s entirely possible that the rest of the crew won’t even know of his acquaintance with Hex until they cross paths. Jonah Hex may already know Rip Hunter, but Rip won’t be the only character whose interactions with the cowboy will be especially exciting on the small screen. According to Jonathan Schaech, one of the Legends will be a fun foil to his character. The Atom. Brandon’s character. They just, his innocence, it was perfect, fitting with Jonah. Here’s this wisely, grisly character in Jonah Hex and then this, I hate to say it, but this Clark Kent-ish naivety. It just played off each other very, very well. Brandon Routh’s Ray Palmer has been at his most entertaining in both Legends of Tomorrow and Arrow when his effusive enthusiasm is directed at a very serious character. He’s a great comic character to bounce off of a straight man, and it looks like Jonah Hex will be as gritty a character as Ray has ever encountered in the Flarrow-verse. The trip to the Wild West will be the first major time that the Legends have traveled significantly into the past, and Jonathan Schaech’s Jonah Hex sounds like the perfect character to introduce them to an incredibly different era. Given that a lot of the crew of Legends of Tomorrow are likely to return in Season 2, Hex could even be a fantastic character to bring back in the future. Rip, Ray, and the rest of the Legends will encounter Jonah Hex on Legends of Tomorrow tonight at 8 p.m. ET on The CW in its regular Thursday timeslot. To see when your favorite shows will be returning to the airwaves in the not-too-distant future, check out our schedule of summer premiere dates.